The 33 metre motor yacht Pantaran is sold with Atalanta Marine and Marine Marketing in Greece working together to represent the buyer and seller. Built in aluminium by Italian yard Cantieri Navali Lavagna to ABS class, Pantaran was delivered in 2003 as an Admiral model with a refit in 2012. Accommodation is for 10 guests in five cabins consisting of a master suite, VIP suite and three twin cabins, all with entertainment systems including LED television screens and all with en suite bathroom facilities. The large saloon has settees to port and starboard with a built in bar aft and an entertainment centre including a Samsung television screen. Forward is a formal dining area and further forward still is a fully equipped galley with a breakfast nook for casual snacks. Outdoors, the aft deck is sheltered by the flybridge overhang and offers al fresco entertaining and dining at a set of bistro chairs and a table while the flybridge is massive – ideal for large parties with extensive seating to port and starboard, a bar and electric grill. Twin 2,285hp MTU engines give her a cruising speed of 20 knots and a top speed of 24 knots. The 2012 refit was extensive and saw all the guest accommodation woodwork replaced, new LED lighting installed throughout and a repaint of the superstructure. In addition, all the mechanical and electronic equipment was serviced and replaced where necessary. 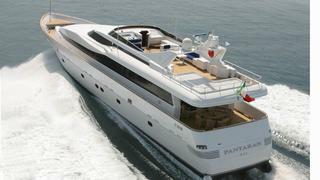 Lying in Cannes, France, Pantaran was asking €1.9 million.